Economics and the state of the civilized world are forever intertwined. Human nature’s instinct to forego painful decisions has been demonstrated throughout the history of government currencies, which often lead to financial devastation among those dependent on the flow of money for goods and services. The government production of paper money, once public faith is fully invested in its symbolism of wealth can proceed to expand to cover ‘unforeseen’ expenses. As this supply grows and now more currency is available to buy goods, prices rise to balance the supply/demand curve. The emotion of fear over common sense promotes a continuation of this dramatic expansion of money: fear of lost elections and thus the loss of power; the fear of riots by those suffering the painful inflation; and the fear of their own personal financial ruin. This titanic economic collapse of countries and their governments is best illustrated by the printed paper promises that litter the empty streets of bad judgment. This hyperinflationary currency has been written about in a previous issue of Studium Magazine. However, an extreme example of this malfunction of government fits nicely in a Cabinet of Curiosities. Germany’s well-documented 1922-1923 hyperinflation stemmed from the beginning of World War 1 in 1914. Up until that time, the gold mark was the currency of choice (valued at the time at US 25c). Expecting to win the war and subsequently seek riches from the defeated, they simply borrowed the funds needed from the banks to boost their military might. Alas, the war was not theirs to win, and they were the ones to give up their nation’s wealth to the victors through the Treaty of Versailles. Their claims to these riches and the enforcement they attempted to make upon Germany became the perfect excuse for the government to continue printing money. Paper left the printing presses to be used for German infrastructure, health, education, and welfare. As the value of the Deutschmark fell, larger denominations were created with a slight increase in ink to buy goods that by mid-1922 had risen in price 40 to 50 times their value from eight years earlier. Currency had no longer been convertible to gold since 1914, due to fear of its flight from the country. So, with the continuous rise in wages, prices, money in circulation and public anxiety, the ship of state continued on its path toward the jagged rocks of economic collapse. 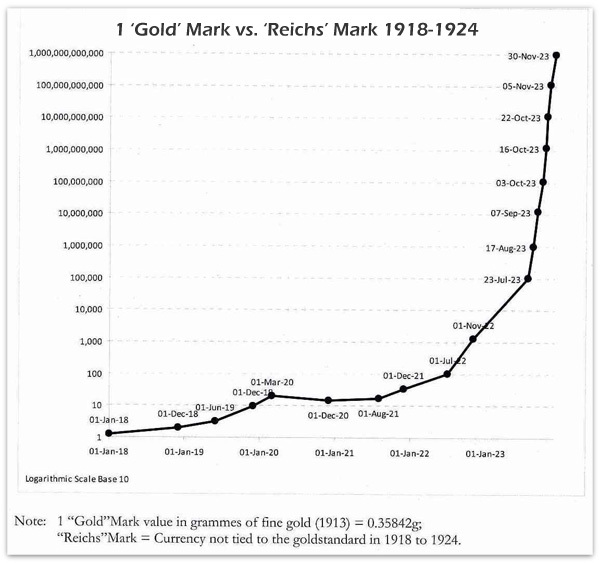 As the chart solemnly indicates, the decisions of those in power in Germany resulted in the value of a gold mark to increase by over 250 billion times its 1918 equivalent. The rampant inflationary turmoil stabilized in late November of 1923 with the new rentenmark, but not before two of the largest denominated notes were issued by the Bank of Germany – the one and two billion mark note. 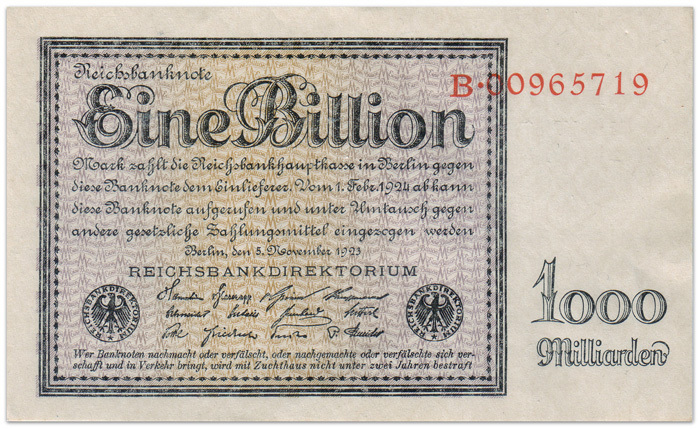 At the time of their issue at the tail end of the hyperinflation, the one billion mark note pictured here would simply purchase the equivalent of three eggs. Countless lower denomination notes were burned for heat, papered walls in homes, or simply blew down cold, destitute streets. A single rentenmark was exchanged for one trillion reichsmarks, and was based on the asset that remained Germany – land. 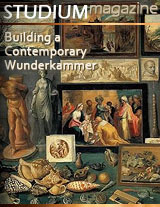 Finger-pointing continued towards France and England, as well as domestic market speculators. Blame, however, still lies with those government politicians who could but would not make the painfully austere decisions that would have avoided this terrible incident in world economic history. Collector value for hyperinflationary notes vary, with those from Germany commanding from $1 for common varieties to over $2,000 for the highest (and rarest) denomination, the two billion mark note.